LG said its G5 smartphone will be available for sale in Korea starting March 31, with the U.S. to follow April 1. The G5 will reach other regions, including Europe, Asia, and the Middle East, over time. LG says more than 200 carriers plan to sell the phone. In the U.S., that includes AT&T, Sprint, T-Mobile, and Verizon Wireless, all of which will offer the phone on April 1. 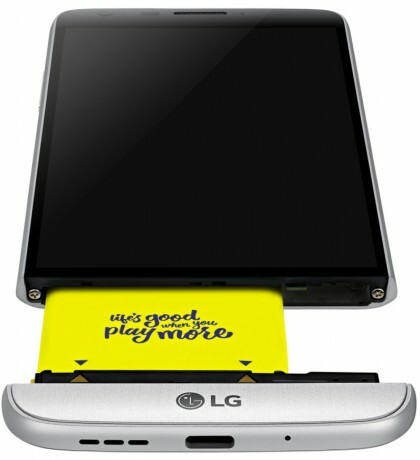 Along with the G5 itself, LG plans to sell the accompanying modules and accessories, called LG Friends. The two most notable Friends as the CAM Plus and Hi-Fi Plus, which are modules that plug directly into the bottom of the G5. The CAM Plus will be available in the U.S., but LG hasn't said if the Hi-Fi Plus will also be available. Other Friends include the 360 VR headset, 360 CAM, Rolling Bot, Tone Platinum, and H3 by B&O. Pricing for the LG G5 varies by carrier. The phone has a 5.3-inch quad HD display, Snapdragon 820 processor, 16-megapixel camera, and USB Type-C.